I always feel incredibly honoured when a brand or PR agency reaches out to me to see if I'd be interested in some of their products to try out, and was recently contacted by Baobella with the chance to try some Yves Rocher skincare products in exchange for a post about them. I'm not at all familiar with Yves Rocher, save for a lovely brown eyeshadow I recently received in a subscription box (it pairs well with my blue eyes!) and so I held out hope that their skincare products would be just as lovely. 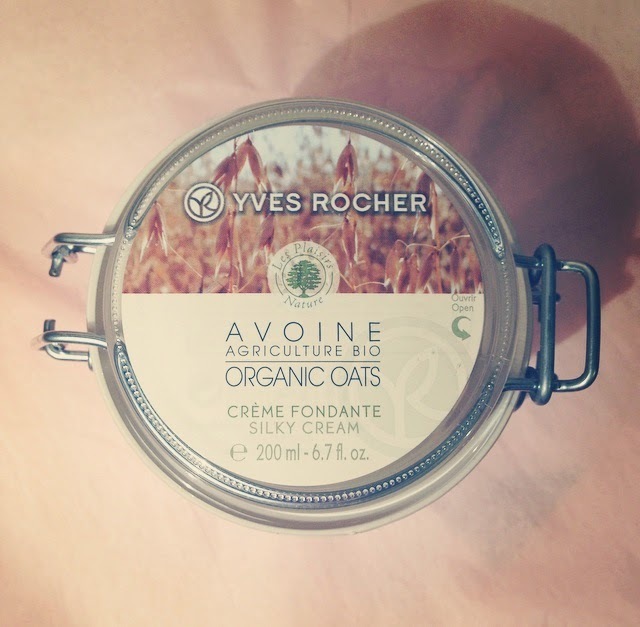 Yves Rocher has been voted the number one favourite beauty brand in France, and boasts a plethora of products from sun care, to haircare, makeup and fragrance to name just a few categories. After a mishap with the postman, a little brown box finally appeared in my hand containing a body lotion, Silky Cream which contains organic oats (RRP £13.50), a leg and foot cream, Anti-Fatigue Iced Gel (RRP £5.00), a botanical hand cream (RRP £3.90) and also a gorgeously scented coconut bath fizzer (RRP £1.50). I've had a chance to try out all of the products (apart from the bath fizzer - more on that in a minute) and on first impressions they're all incredibly lovely to use. My favourite product of the selection I was sent is the long-lasting moisturising botanical hand cream. As someone who works hands on with food day in day out keeping my hands in good condition is incredibly important to be or else they'd be very weathered from constant hand washing and food preparation. 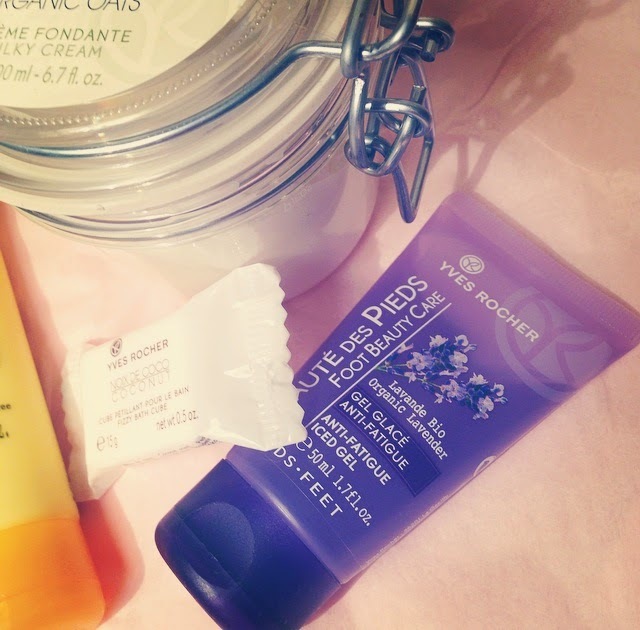 This hand creams applied very well, absorbed quickly and left my hands feeling pampered. Silky Cream comes in a hefty 200ml jar so there's plenty of product for your money and I know that this will last me for a long time yet! It's an all over body moisturiser that's fragranced with organic oats, which are not strictly to my taste (I much prefer sweet and fruity scents) but it's not too powerful. The lotion absorbs quickly into the skin leaving your limbs feeling soft and pampered. I can definitely see myself buying one of these for my Mum for her birthday, she'd love the scent! The final two products are particularly apt for my current life situation. At the beginning of this week I had to go into hospital to have surgery on my foot. I'm currently propped up on a pillow at home and feeling a bit sorry for myself, but mostly because I have to wear sandals and flip flops everywhere until my foot heals (summer shoes in January are not the one!). I've been using the Anti-Fatigue Iced Gel on my feet around my bandages to help, literally, take the weight off them and give my poor feet a bit of TLC following the anaesthetic and the procedure. It contains peppermint for a refreshing feeling, as well as lavender to promoted general foot comfort and well-being. That said, the coconut bath fizzer is something I desperately want to try (I love baths and coconut!) but I'm not actually allowed to get my foot wet for another 4-6 weeks, *sad face*. I therefore cannot give you an actual review on that, but I promise you it smells divine and the Yves Rocher site promises immense relaxation with its use so I'm excited for that! 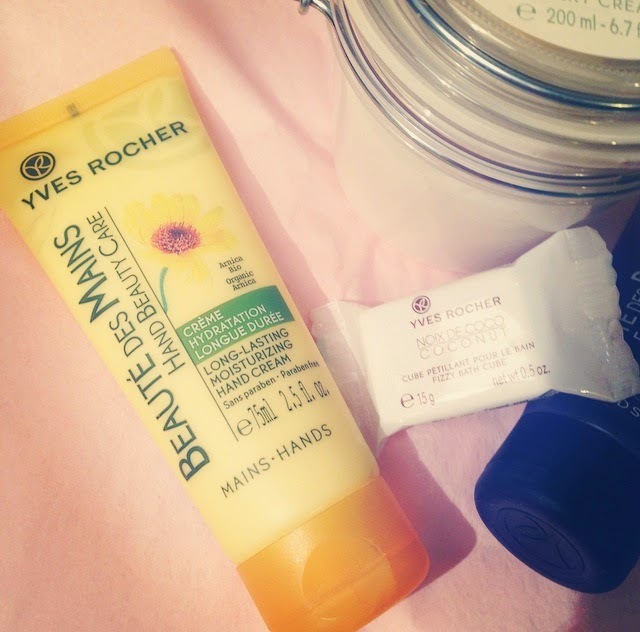 Have you ever tried any Yves Rocher products? 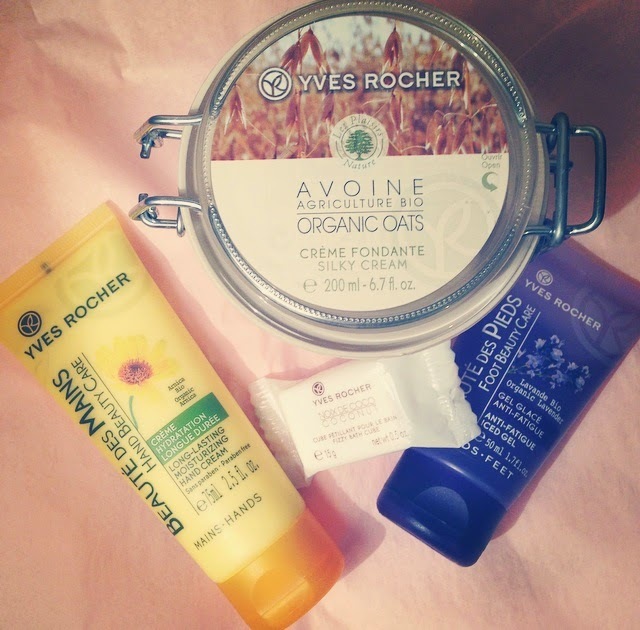 I've just recently tried some Yves Rocher products, too and I like them! That oat lotion looks really lovely - love the packaging!